Think Assassin’s Creed might not be as great as everyone thinks it is? You’re not alone. Nick D. takes you through his top 5 reasons why Assassin’s Creed is a terrible series. I don’t like the Assassin’s Creed series, though I don’t begrudge those who do. Like many, I was excited at the build up for the first Assassin’s Creed. The idea of playing an assassin and getting to explore ancient cities in a quasi-open world environment was simply too irresistible. Then the game came out. Everything started off well – the game’s promise seemed delivered. But there was something festering underneath the slick package, something I couldn’t quite place my finger on until I was at least 5 hours in. It turns out that it was my old friends: bad writing and total lack of depth. When these jaunty fellows showed their faces, the game took a nose dive, and I never felt even remotely interested in continuing the game. Cue Assassin’s Creed 2. Relying on the ‘fool me once shame on you’ paradigm, I avoided it. That is, until the game scored 90s all over the place and caught my attention. “All right,” I said. The concept of Assassin’s Creed is still good. Maybe this was one of those sequels that took the great ideas from the first and completely renovated the game to really make those ideas pop. ‘Fool me twice shame on me.’ I enjoyed playing the exact same game for about another 10 hours before complete and utter boredom and contempt washed away all incentive to play. My experience with other Assassin’s Creed games since have been limited to what I’ve played at friends’ houses, but everything I’ve seen has not, in the slightest, impressed me. Call of Duty gets so much flak for presenting nearly identical game after nearly identical game every year. Assassin’s Creed deserves the same. Sometimes games are released, and they just haven’t gotten into the swing of things yet. There is a huge difference between the original Street Fighter and the genre-starting Street Fighter II, or Dynasty Warriors and Dynasty Warriors 2. Sometimes, it takes a little time to really iron out the gameplay balance and problems with your game. Truly, there is nothing worse than a game that refuses to update a system that simply doesn’t work. This brings me to Assassin’s Creed. The controller face buttons being mapped to individual limbs was a decent concept, but damn did it not work fluidly. The basic combat is broken at a core level, and that’s even ignoring the shoehorned, linear assassinations, which provide as much freedom as Final Fantasy XIII provides side quests. Of course, to overhaul gameplay systems would require a substantial effort, testing and money. Adding new systems can be done as a new feature, which is why sailing was the best part of Assassin’s Creed III and Black Flag. However, the core systems only get tweaks as new features get stapled onto the game’s broken body. All of these new features are shiny at first, and they do thrill for a time, but there’s not substance behind them. Exploring cities is fun… for twenty minutes. When you realize that everything is identical, every bale of hay is the same, and every turn is just another reskin, things get a little boring. A grand palace built on two inches of plywood is unlikely to stand for very long. Of course, some games aren’t all about gameplay. Since Assassin’s Creed is a single player game, there is a heavy focus on story. Unfortunately…. I like all sorts of stories in video games. I like serious stories as found in games like Mass Effect 2. I like silly stories like in Resident Evil 4. Both of these games know exactly what they want, and they really make it shine. Assassin’s Creed seems to want to have a serious story, but then they throw in the most cringe-worthy scenes and writing that would make the writers of Diablo III blush (that’s not true, nobody is worse than the writers of Diablo III). The idea is simple: you’re an assassin in a random time period, and you kill people because evil world order conspiracy! Anyway, this is just a setup so you can explore huge, interesting cities, and meet famous figures from history. So, you’d assume that if you’re going to have your poorly voice-acted assassin interacting with figures such as Leonardo Da Vinci, then the writers are going to treat that character with respect, or at least dignity. Ha, ha, nope. Da Vinci is a fool, and a generic video game inventor with all the answers and mountains of implausible gadgets. Real historical events are treated with the same respect an excited dog has with your personal space, and it shows. Then there’s the fact that Assassin’s Creed is actually a sci-fi game. For reasons I’ll never understand, it wasn’t enough to have you play an assassin in a certain time period. No. You had to play an idiot in the future, who would relive his assassin ancestors’ memories through a magic sci-fi machine. I hear that these segments have been largely phased out after Assassin’s Creed III, but the fact that they were even thought to have been necessary is enough to tell you everything. The game’s writing is so spastic, the developers didn’t even think that being an assassin killing evil templars in the Middle East was enough to hold our attention. After all, what mad man could think of a full story from that setup? Obviously, there needs to be sci-fi elements tacked on too. It’s not like that would undermine whatever story you were trying to build in the past. 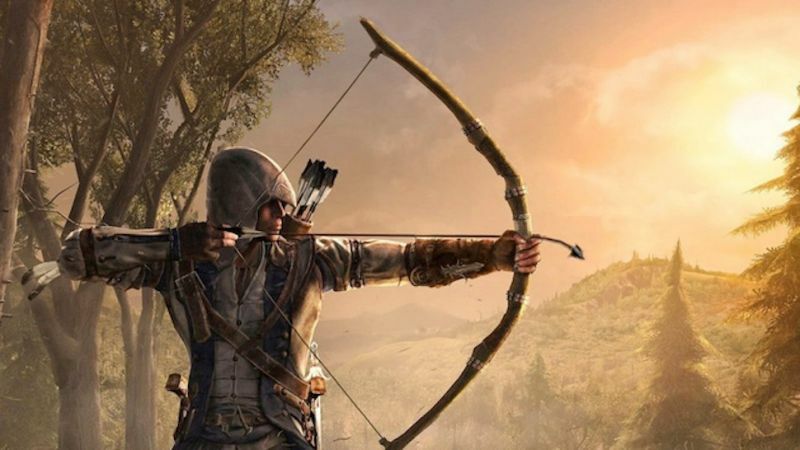 How long did it take before you could play as Connor in Assassin’s Creed III? Anyway, spastic storytelling and one-shot gameplay could be good, if the game was designed to give you something fresh and new at every corner. Unfortunately…. And dear lord is it boring! Climbing up a tall church and propelling yourself off and into a bale of hay was really neat… the first 10 times. Getting into a fight with a bunch of guards and button mashing them to death was kind of empowering… until the 42 identical encounter. Oh, collectibles! Wait, it’s the same damn thing over and over again. I can live with weak gameplay. I can live with a bad story. But I cannot stomach a game that bores me. I’m not in school; I don’t have infinite time for games. Why would I waste my time on a game, whose developers confused padding with content? That’s the biggest problem with Assassin’s Creed. You will do something once, and it will be fun. Then the game will make you do it again, and again, and again, until there’s absolutely no enjoyment to have from the activity. In many ways it’s very meta of the developers. After all, what is Assassin’s Creed other than the same thing over and over again? Every game is only has the thinnest coat of new paint that you don’t notice that you’re playing the exact same game until it’s too late, and Ubisoft has your money. And this practice isn’t doing anyone any favours. Instead of learning from pros like Blizzard, Valve, or even Square- Enix (don’t shoot me) and only releasing games after long, well thought out development cycles, Ubisoft is completely content with rolling out the same game until it inevitably crashes into the ground. Obviously, I’m in the minority, and I concede that. Assassin’s Creed is a very popular franchise, and I realize that my opinions are not fact. However, I simply can’t get behind Assassin’s Creed, and I won’t. High review scores won’t trick me again. There’s nothing but flash here, flash and bright sparkles, stapled to the side of a rotten hull. I skipped the original game because of the bad reviews stating it was repetitive. Then I jumped into the sequel due to stellar scores and really enjoyed it. Buying number three was, then, a no-brainer to me, but it was a very dull game. There was little to no engaging gameplay and, to make matters worse, the game undermined the greatest thing about the series, the freedom, by scripting its missions to the point one felt in shackles. I was about to give up on the whole thing when Black Flag was announced as a Pirate-themed AC game, so I jumped aboard and loved it. However, now that Ubisoft has hundreds of installments coming out and I can barely keep up, I am just going to drop the series altogether. Sorry for the long story, but coming back to your article, which is great, I agree, even though I don’t feel as negatively about the franchise as you do. Congratulations Nick. Do you feel as if you’ve accomplished something? It’s the way of the current videogame industry. You either get the same rehashed franchises every year because those AAA devs and publishers are afraid to try something new and risk it all (to win big) OR you can buy into indie garbage at little cost. That industry crash better come soon, it’s time to shake things up. One little gripe though. Every single game ever is doing the same thing over and over so repetitiveness is a flimsy thing to base any argument on. Can’t say that i agree with you (i am an AC fan), but you do have a point in certain areas as they could definitely take some time to polish things out some more and repair the glitches and the mistakes that get us, the gamers, so frustrated.